Mr. Sato is one of the front runners of what we might call "creators" or "art designers," creating very unique, fresh, and original designs in various fields, including the flag shop of UNIQLO in NYC, and more recently is also active as a producer. His works are uploaded in his beautiful web site. Mr. Sato told me the stories behind the making of this site. 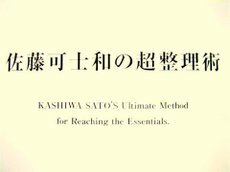 His book "Kashiwa Sato’s Super Technique of Getting Things in Order (original title Sato Kashiwa no Cho Seirijyutsu)" is fantastically interesting in its insight into the basics of professionals. I recommend you to read this by all means. He says that designers are like (medical) doctors to the clients. His more recent books include "Kashiwa Sato × 31 Top Runners (original title Sato Kashiwa × Top Runnter 31 nin)," etc. Books about Kashiwa such as "How to make SAMURAI Sato Kashiwa (original title SAMURAI Sato Kashiwa no Tsukurikata)" are also available. Please search for these books at Amazon. What happened was that by introduction, I visited his "SAMURAI" office which was actually located very close to my office. Just as described in the book, his office was stylishly neatly organized, chairs were placed very precisely in rows at the meeting rooms, and the colors were just beautiful. I spent about an hour there. It is truly a great pleasure to meet first class people in different fields. There are so many things to learn from them. 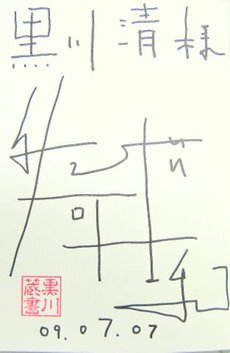 Another example of inspiring artist whom I saw recently is Mr. Kunio Kato of the Academy Award. He is also very attractive in a different way.